The reason is simple: The game discs themselves aren't kept in the store, in case of a police raid. So after you opt to purchase a game, the seller will tell an associate to bring you a copy. It doesn't take much time, and your CD or DVD will probably come packaged in a small plastic black bag, with another photocopy of the cover jammed inside. The asking price is ridiculously small - usually around R$10 to R$15 (or $5 to $7.50) - but after a little negotiation, you can easily end up paying half that. You won't, of course, receive a receipt; instead you might be giving a business card with the name of the game you purchased written on the back, with the promise that you'll be able to exchange the game in that store if it proves to be faulty. Although there is a large sensation of seediness associated with these transactions, the fact that you can expect the store to be there for the next week makes the experience not too unlike that of buying a game legally. After all, new releases are very quick to arrive, if the game doesn't work you can exchange it and you can even find copies of Konami's Winning Eleven series fully translated into Portuguese. What more could a consumer want? What's truly disturbing, however, is what comes later, when you mention to other people that you've bought a pirated game. Instead of scolding or reprimanding you for committing a blatantly illegal act, most people won't even bat an eyelash. If you're talking to another gamer, they may even laud you for your decision. And, indeed, why wouldn't they? There now exists a whole generation of gamers - the 32-bit generation - that probably bought the vast majority, if not the entirety, of their game merchandise illegally. This piracy isn't restricted to games, either, although the bootleg games market is probably the most extensive and blatant. To claim that Brazil is a nation of pirates isn't all that far from the truth. Brazil wasn't always a haven for piracy. After all, up until the mid-'90s, the games market in Brazil was overwhelmingly legal; companies would officially launch and provide support for consoles, such as Tectoy (Sega) and Gradiente (Nintendo). The piracy epidemic only came about with the combination of exceptionally high taxes (EGM Brazil estimated in their March 2005 edition that at least 45 percent of the price of a PC game consisted of taxes), the low income of most Brazilians, the lack of an effective government anti-piracy program and, ironically, the very factor that helped make games more mass-market: the change of media from cartridges to CDs, making it much easier to copy games. 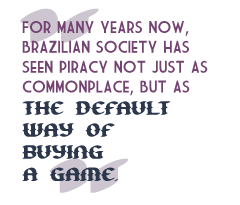 For many years now, Brazilian society has seen piracy not just as commonplace, but as the default way of buying a game. This has had a profound impact on society in general and those who play games in particular.